BikesideSPEAKS drew a trackstanding-room-only crowd to the Westside's BikeRoWave for a lightning round of 7 bike activists, speaking for 7 minutes each, on 7 topics relevant to the cycling community. 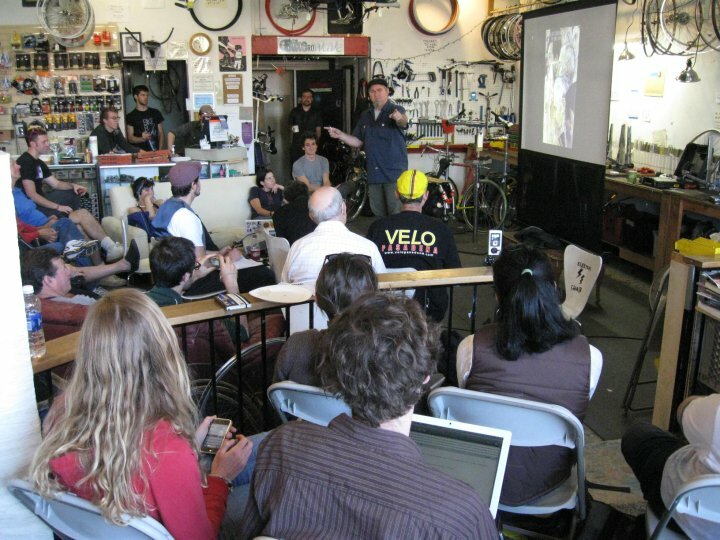 At 5pm, the announced starting time for BikesideSPEAKS, the BikeRoWave looked suspiciously like a bike co-op, packed with bike stands, bikes, bike parts, tools, and cyclists engaged in bike repairs. Then pizza arrived, the crowd swarmed, and BikeRoWave was transformed into a theatre! Steve Mattson, GM of BikeRoWave, warmed up the crowd with a bit of BRW history and a commitment to complement the BRW's wrenching schedule with more community events such as BikesideSPEAKS! Mihai Peteu demonstrated LABikeMap, a crowd sourced community map that provides cyclists with the opportunity to log on and self-report collisions, incidents, road hazards, and hit-and-runs. LABikeMap is already loaded with 10 years of cyclists' collision data and provides a vivid visual of the LA region and incident clusters that deserve more law enforcement focus. Take a look at the map and remember that every small red dot is where a human being on a bike was taken out by a motor vehicle. There is entirely too much red on LA's map. Ron Durgin, President of Sustainable Streets and a League of American Bicyclists Urban Cycling instructor, gave an overview of a campaign to engage and educate cyclists and non-cyclists on the fine art of lifestyle cycling. Too often, cycling is relegated to the side as a "recreational endeavor" rather that a legitimate transportation solution. Key to positioning cyclists as an effective mode share is good planning and education and Sustainable Streets is targeting planners and political decision makers, committed to getting them on bikes and into the urban traffic mix so they can effectively plan for cyclists and support cycling. Enci introduced the LA Greensters, LA's only all-pedal-powered transportation team, created as part of her commitment to sustainable film production and taking on a life of its own. Enci's original objective was simply to make a movie. She wrote the script and set out to direct her first film, not knowing that her commitment to shoot sustainably would challenge the basic Hollywood tradition. 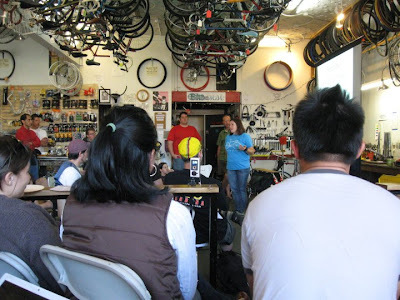 From banning plastic and styrofoam to challenging Hollywood's car-centric bias, Enci's simple call for help from the cycling community led to the formation of the LA Greensters who not only provided all transpo needs for her film, but went on to demonstrate the effectiveness of cargo bikes and Xtracycles in everyday life. Sara Bond gave a recap of the topic that has had the cycling community up in arms for quite some time, hit-and-run incidents that leave cyclists lying in the street, broken and bleeding, while the motorists flee the scene to avoid responsibility. Sara introduced Louis "Bird Man" Bianco who was riding home on his bike when a motorist left-crossed him, causing him to go head first through the window of the car. His face was jerked free as the motorist swerved forward and into a gas station before u-turning and fleeing, leaving Louis in the middle of the intersection. Louis gave a moving account of his long journey to recovery and the fact that he still experiences fear but that he is committed to overcoming it. Alex Thompson, the heart and soul of Bikeside, was joined by Glenn Bailey, the President of LA's Bicycle Advisory Committee, and they got political with their guests Marcy Winograd and Bill Rosendahl. Alex introduced Marcy, the Bikeside endorsed candidate for Congress who met with the Bikeside crew last month and endorsed the Cyclists' Bill of Rights. Glenn introduced Bill, the Chair of the Transportation Committee who long ago responded to the Mandeville Canyon incident by standing with LAPD proclaiming that "Cyclists need a Bill of Rights." I responded to the call by offering a brief introduction to the Cyclists' Bill of Rights, pointing out that they weren't written or conceived or created, they simply exist and they belong to the cyclists who claim them. Rights aren't given and the cycling community is going to have to step up as a constituent group if they expect to experience the most basic of human rights, the Freedom to Move. Our political leadership exists for one reason and that is to remove any obstacles to our ability to enjoy our freedom. Jeremy Grant brought it home with an introduction to the Backbone Bikeway Network, laying it down as a Vision for Connectivity that is based on getting cyclists to destinations, real destinations that everybody else enjoys. The Backbone Bikeway Network is consistent with other dreams that great leaders have laid down as commitments and over and over again, visions that started with no plan, no funding, no support, all became a reality because a small group of people believed and took on the challenge of changing the world. That was the challenge that Jeremy gave to the cyclists, planners, wrenchers and politicians at the BikeRoWave. Let's work together to make Los Angeles the City with a Backbone! BikesideSPEAKS wrapped, some rode off to Crank Mob, some stayed for a screening of Quicksilver, and Bike Week '10 came to an end. How was your week? Trader Joe's - Weak on Bike Week! Bike to Work Week ain't over! CityWatchLA - No More Bike to Work Week!